Hyderabad: Telugu News Channel TV5 News is set to Live Telecast the Second Season of Telangana Premier Kabaddi League (TPKL) that will be starting from 14th September and goes on till 30th September 2018. Telangana Premier Kabaddi League (TPKL) has gained significance after its majority stakes were acquired by digital media entertainment firm Silly Monks, which was listed on the National Stock Exchange, wherein 51 per cent stake in Chintala Sports Pvt Ltd. has been transferred to the sports subsidiary of Sillymonks that is branded as Playmonks. TV5 News is one of the top three Telugu News Channels with extraordinary reach in Telengana and Anadhra Pradesh. 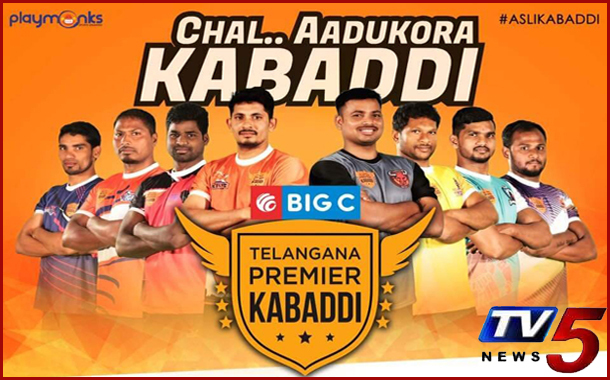 The Channel has alloted its prime time band of 7 PM to 9 PM for the Live Telecast of Telangana Premier Kabaddi League (TPKL). Telangana Premier Kabaddi League (TPKL) is considered as a regional avatar of the hugely successful Pro Kabaddi League (PKL) and it is gearing up for the second season in this September. TPKL entered the sports league arena in 2017, with its first season held at Warangal and Karimnagar between January 21 and February 7, 2017. It brought to the fore the game of Kabaddi from the hinterlands of Telangana and ensured that local players were given the right exposure to talent hunters for the national leagues. In its second season this year, TPKL has adopted the franchise model that is currently followed by Pro Kabaddi League and other major sports leagues in the country. Mr. Sanjay Reddy, the League Commissioner of Telangana Premier Kabaddi League, has been the driving force behind the league. During his years at ESPN, Star Sports and Sony Max, he handled major sports events such as World Cup Cricket, Wimbledon and English Premiere League. With his enduring interest in sports entertainment, he plans to nurture a similar property in his home state of Telangana.